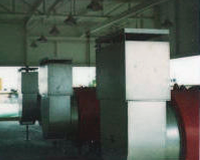 Industrial Noise Silencers for: incinerator exhausts; intake and exhaust cooling air for diesel generator units; laboratory hood exhausts; large hp TEFC motors; baghouse exhaust stacks and high-pressure blower intakes and exhausts. 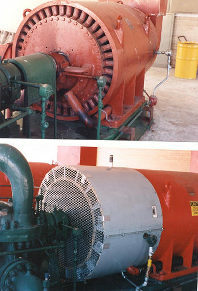 This application of an Oxel Spiral Silencer on a 400-hp TEFC motor, reduced the noise by approximately 27 dbA. The pressure drop across the silencer is so low as to only result in a temperature increase of approximately 1-deg. F.
These silencers are manufactured by Innovative Metal Industries, Inc. They have been applied to large and small TEFC motors in a wide variety of industries including severe duty areas like petro-chemical plants. This is an Oxel Dual-in-Line spiral silencer during the manufacturing process. It incorporates two spiral silencers with an air-gap between, in the direction of air flow. This notably increases the noise reduction (Insertion Loss). They have even been produced as a Triple-in-Line where extremely high Insertion Loss was required and space was at a premium. 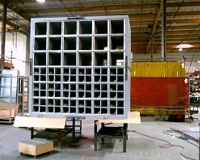 A 10′ – 12′ long baffle type silencer would be required to provide the same acoustical performance. It would also impart a much higher pressure drop than the Oxel silencer. This unit was split into (4) sections to facilitate the field installation. 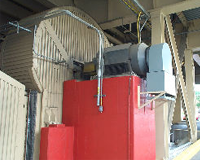 The use of Oxel Spiral Silencers on these 800-hp TEFC pump motors, reduced the noise in the adjacent Control Room by 24 dbA. These units are for a gasoline and oil pipeline installation. The exhaust air silencers for these 800-hp TEFC pump motors helped lower the noise in a nearby office trailer. Note the Before/After pictures. The “Before” picture clearly shows the annular ring where the air is exhausted. As can be seen in the “After” picture below, the silencer was split horizontally to allow access to the coupling without requiring complete removal of the silencer. The Oxel silencers are designed for minimal pressure drop. This is critical for motor silencers where the motor fan would not provide adequate cooling if the pressure drop was too high. A metallurgical products manufacturer had complaints from neighbors across from their plant, due to the exhausts of two process blowers. This picture shows the first of two silencers installed that reduced the noise levels at the Property Line by 22 dbA. Due to the comparative light weight of Oxel silencers, no other structural support was required. The acoustically treated cap provides added noise reduction and protection from the elements. 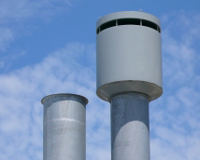 Conventional baffle type silencers are used in a wide variety of applications: fan silencing in an HVAC fan-coil unit; for the intake or exhaust of a cooling tower; for blower intakes or exhausts. The neighbors across the street from a group of (5) Emergency Diesel-Generator units for a computer, data storage/recovery company, were complaining about the excessive noise. The originally installed lined intake and exhaust elbows did not provide enough noise reduction. They were all replaced with these silencers which brought the levels down below the Property Line Limits as specified by the local code. This picture shows the shaped inlet end of the baffles and the perforated/absorbing section, following it. 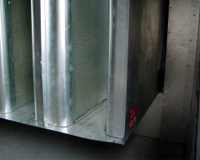 For indoor HVAC applications, the outer shell is typically 24-ga. galvanized steel with 26-ga. perforated, galvanized steel baffles. For outdoor or industrial applications, the gauges are increased for longer life characteristics or in consideration of more rigorous environments. In some applications, space is so limited, there is no room for a conventional silencer. 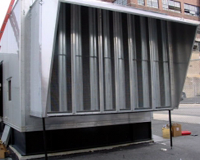 In such cases, an acoustical louver may provide sufficient Insertion Loss and serves the dual purpose of minimizing the intrusion of rain into the room or enclosure. 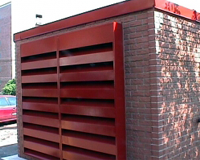 This cooling air intake for an Emergency Diesel-Generator enclosure provided an acceptable noise reduction and was also aesthetically pleasing. Note the fiberglass brick fascade which is actually attached to our 4″ thick modular steel panel enclosure with a standing seam roof. These 12″ deep silencer modules were used to act as a “silencer/barrier” around the three open sides of a large tonnage chiller unit. They provided the required 10 dbA reduction without affecting the air flow. They also acted as a “sight-barrier” to the compressors and piping below the coils. 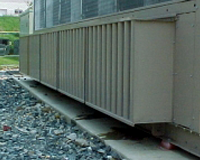 One of this major HVAC equipment manufacturer’s design criteria, was to provide a more “elegant solution” compared to the previous sheet metal enclosures around the compressors.